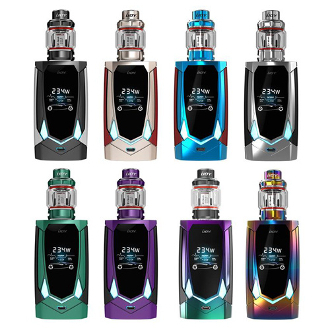 The Avenger 270 Kit from iJOY is a high tech kit with all the bells and whistles you can imagine. This kit boasts a powerful 234w capable mod box that uses 2 batteries and has a temperature control feature. It is the first of its kind in the world to have an AI board and uses the micro USB charging port to update its firmware. It is also voice activated. This amazing mod has been programed with several voice commands to make your vaping experience as high tech as it will be satisfying. You also have the capability of changing the color of the LED lights on the front of the device. The tank that has been paired with this kit is the Avenger Sub-Ohm Tank. This large stainless steel and glass tank can hold up to 4.7ml of e-liquid and is top-fill. It has a dual airflow control ring found at the bottom of the tank. This allows you to customize the airflow of your vape. It comes with a wide bore drip tip and is a 510 connection. Note: All Temperature control Mods require you use nickel, titanium or stainless coils.